No two ways about it, this Monday morning in London is the definition of grim. All the more reason then to turn that frown upside down with a new guest mix from Touchy Subject, a London-based producer you may remember as one of our first ever guests back when I took over the Rhythm Incursions guest series in 2008. Four years later the man is still at it, having had releases on Numbers among others. We’ve featured him on the show a fair few times too, and he keeps delivering the goods every time an email hits the inbox with some new music to check. Here are some bits and bobs I’ve been playing recently when djing late night sets with some down time at the end. My mac was punished making the mix as you will hear what the poor guy sounds like at the end. 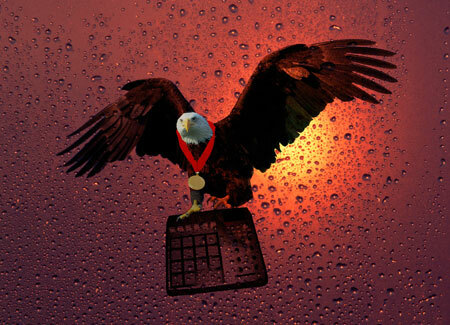 This eagle has won its medal. Been locked up in the studio with loads of new material to come from myself and a few other projects, one being the Yawning Young stuff. Lots of free downloads on my Soundcloud for those who care to indulge. The Soundcloud in question is found here, and he wasn’t lying – it’s chock full of goodness. If you live in London you can catch Touchy Subject at the Cardboard Boss parties in the pulsating trendy nerve centre of the city that is East London. For now sit back and enjoy. As always you can download and/or stream below or simply subscribe to the RSS/iTunes feeds and never miss a show. This entry was posted on Monday, September 24th, 2012 at 2:46 pm. It is filed under Podcasts, Guest Mixes and tagged with Lorn, Big Boi, Touchy Subject, Om Unit, Salva, Teebs, Eprom, Kidkanevil, EAN, Doshy, Krampfhaft, Danny Scrilla, Deft, Fracture, Philip D Kick, Dub Phizix, Flosstradamus, H-Sik, TNGHT, Shiftee, Clicks & Whistles. You can follow any responses to this entry through the RSS 2.0 feed.